The stunning aquamarine waters and jaw-dropping coastline of Cancun has made this town one of the most popular destinations in all of Mexico. Known as the "Mexican Caribbean," Cancun is a haven for beach lovers, sun seekers, and revelers. The white sand beaches in Cancun stretch for miles, and along its shores you can find great dining, shopping, nightlife, and world-class resorts. Whether you're traveling to Cancun to experience its famed nightlife or to relax on its pristine beaches, you should work with Vacatia to find the perfect vacation rental for your stay. Vacatia aims to find the best vacation rentals available for travelers, and Vacatia will strive to find a rental that meets your needs and exceeds your expectations. Whether you're traveling solo to Cancun or you're heading to this Caribbean paradise with your significant other, Vacatia can help you book your stay at one of the best studio rentals in Cancun. So if you want to make the most of your time in Cancun, rely on Vacatia to help you plan your trip to paradise. Cancun is home to some of the most picturesque stretches of beach in the entire world, which is why it's such a popular destination for those seeking sunshine and tropical waters. Situated in the Mexican Caribbean, Cancun provides an abundance of outdoor activities that visitors will love, from fishing and snorkeling in the crystal clear waters to playing sports on the sugar-white sand beaches. No matter what Cancun has in store for your vacation, you should work with Vacatia to book your stay at one of the best Cancun short term rentals available. Unlike a standard hotel, a Vacatia property includes added living areas, such as a fully equipped kitchen, in addition to the desired services of a resort. When you stay at a Vacatia rental, you'll be able to enjoy the comforts of home as well as the luxuries of a resort, so you're sure to enjoy every moment on your stay in Cancun. 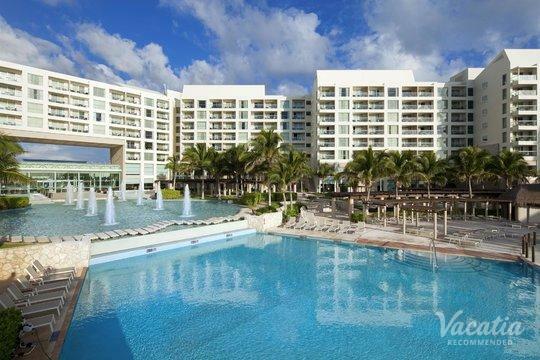 Let Vacatia help simplify your vacation planning process by finding you one of the best condo hotels in all of Cancun. Cancun, often called the "Mexican Caribbean," is situated on Mexico's Yucatan Peninsula. This narrow peninsula is surrounded by sparkling aquamarine waters that create the perfect backdrop for a vacation in paradise. During your stay in Cancun, you can enjoy the endless beauty of the beaches and the lively energy of town, or you can head out of Cancun and explore ancient Mayan ruins. No matter what you have on your Cancun itinerary, you are sure to find your own personal paradise in this Mexico hotspot. After a long day in the warm Mexico sunshine, you'll surely want to return to a comfortable, spacious vacation rental that you can call your home away from home. So make sure that you have your own personal home away from home in this Mexico paradise by booking your accommodations through Vacatia.